Hokkien noodles are fresh wheat based noodles that are a lot like fresh fat spaghetti. They are usually in the chiller section of the supermarket, although I have seen some that are shelf stable in the Asian food section. 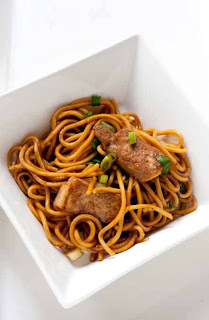 If you can’t find hokkien noodles any other thick wheat based noodle would work well or even some spaghetti or bucatini. Place noodles in a heatproof bowl and cover with boiling water. Allow to stand for 1 minute then massage to loosen into individual strands. Meanwhile, heat some peanut or other vegetable oil in a large wok or frying pan. Add tofu and stir fry until golden brown. Mix together soy and honey in a small bowl then add to the wok. Stir and allow to cook until slightly reduced. Drain and toss through noodles and green onion and serve hot.